Laserpas, a leading utilities management company, has helped the biggest distribution network operator in Slovenia, Elektro Ljubljana, improve its power line maintenance efficiency by inspecting a portion of their grid. In the area inspected, Laserpas helped identify multiple objects that posed an imminent danger to the power grid as they could potentially lead to power supply interruptions and, in worst case scenarios, bring about serious injury or even fatalities. During the inspection, Laserpas used piloted helicopters equipped with industry-leading technologies, such as 3D LiDAR scanning and high resolution image capturing, including thermal images. 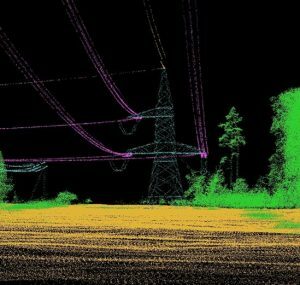 Laserpas’ technology allows companies to detect potential power grid hazards that would otherwise go unnoticed, even if the power lines were to be constantly subjected to other methods of surveillance. The Elektro Ljubljana project located areas where vegetation was too high, identified structures (buildings, fences, street poles and more) within the corridor clearance zones, and revealed trees that pose substantial risk to the power lines. In addition, conductors too close to other power lines were reported. Laserpas also captured data where foot or vehicle patrol inspection would be difficult to conduct, over rivers and water streams, and roadless areas. The densely populated and industrial locations were also inspected speedily and with minimal disruption, which is much harder to achieve during manual power line surveys. “Our findings clearly indicate that in order to avoid serious accidents and even the loss of human lives, we must continuously monitor our power grids’ safety. Laserpas and Elektro Ljubljana share the same values of ensuring that the efficiency and safety of the power lines are ensured. We are proud to be able to contribute to restoring the reliability of the network with the right use of powerful innovations,” said Vaskela. At the moment, Elektro Ljubljana is analysing and evaluating the data delivered in order to optimise its future helicopter inspections. The company noted that “Laserpas proved to be a flexible and reliable partner”.